Date Added: Sunday 13 January, 2019 by Matt S.
Date Added: Tuesday 27 November, 2018 by Simon B. Now this is a favorite tie of mine, it arrived today and i got to see it for the first time in my hands. It's really soft and definitely high quality. It's the best tie i have ever seen, honestly, it's incredible. The screen accuracy is out of this world, and definitely THE tie i will be wearing to every occasion! I am definitely buying more ties, Thank you Magnoli :).. Date Added: Tuesday 11 September, 2018 by Haider B. Date Added: Monday 30 July, 2018 by Brian W.
This was the first tie and product I ever got from Magnoli Clothiers for my 10th Doctor cosplay, I absolutely love it and wear it frequently.. Date Added: Wednesday 27 June, 2018 by Maverick H.
Date Added: Monday 21 May, 2018 by RenÃ© v.
The Swirly Tie is absolutely briljant! 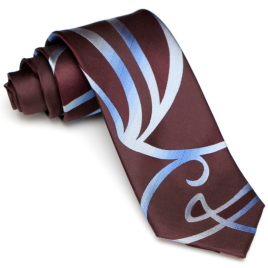 The pattern is identical to the tie used in the Series. The quality is great, definitely worth it!..